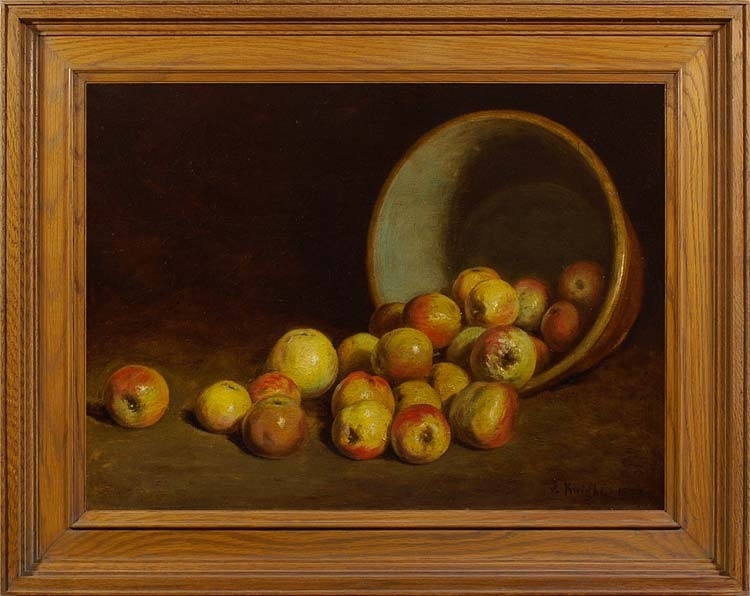 A rare example of a still life by Knight, this spare and beautifully achieved painting of apples spilling from an earthenware vessel demonstrates his talent; it recalls aspects of similar subjects by Gustave Courbet and Luis Meléndez, marrying the painterly realism of the first with the piercing vision of the second. It is above all masterly lesson in form and texture. Joseph Knight (1837-1909) was born in Manchester; he lived briefly in London, where his last son was born, but by the 1870s he had moved to Denbighshire, with his wife Elizabeth, four sons and two daughters. Although he began as a portraitist, he was principally a landscapist, working in both oil and watercolour, and producing engravings; he is also known for his small genre paintings. He exhibited at the Royal Academy from 1861-1908; became a member of the Royal Institute of Painters in Water Colours (RI) and of the Royal Cambrian Academy (RCA), and an associate of the Society of Painter-Etchers (RPE). In the 1870s his studio in Wales became the focus for meetings of the group of young artists known as the Manchester School, including John and Joshua Hague; by 1880 a considerable number of these artists – the Hagues, FW Jackson, H. Clarence Whaite and Edward Norbury – had colonised the Conway Valley near Knight’s home in Bettws Y Coed, and were planning to found the Cambrian Academy (constituted 1881), which became ‘Royal’ in 1882. Works in public collections include A tidal river, 1877, Tate; Knight’s diploma work for the RPE is held with the Diploma Collection by the Ashmolean Museum.